This post is a placekeeper I use as a memopad to resources. It is not complete, nor will it ever be. As I find interesting stuff in regard to the re-emergence of the devine feminine, I will upload them to divshare and provide downloadable links at the bottom. Isopata is a good place to start. Comentary I see some really disturbing trends in society. In the ’70’s Feminism was an egalitarian movement. It has turned vicious and society is deteriorating rapidly. Consider Islam, what started as an egalitarian inclusive progressive society has been hijacked by wingnuts and we are left with an oppressive society, psychotic in nature. ApocolypseSoon or ReturnToBalance The choice is yours or you can buy your burkas girls. Isopata – the seal The double Ax was the symbol of the Snake Priestess. 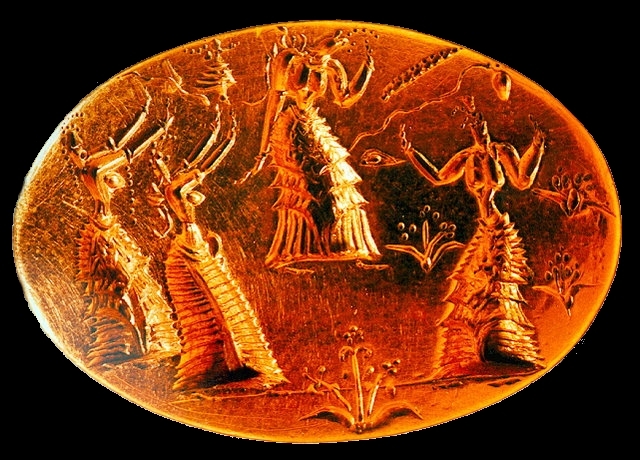 The Snake Priestess of Minoan Crete were the keepers of the Goddess’s Double Ax. The Hall of the Double Ax is one of the most complete Goddess worship sites ever discovered. Thousands of devotees would gather there to do the spiral dance. This entry was posted on July 23, 2010 at 5:51 am and is filed under Godesses with tags Creatrix of the Nile Flood, Diadem of Life, divine feminine, Divine Mother, Female Principle in Nature, feminine god, Feng Shui, Fresh Tuft, Fructifier, Giver of Life, Goddess of Moisture, Green Goddess, Heavenly Mother, Isis, Lady of Green Crops, Lakshmi, Mistress of the Earth, Mother Earth, Mother God, mythos, psyche, self help, shakinah, She of Green Wings, Sophia, spiritual emergnce, Tara. You can follow any responses to this entry through the RSS 2.0 feed. You can leave a response, or trackback from your own site.